It was Saturday morning and I had the whole day for birding. I had heard about a possible Say's Phoebe at Maplewood Conservation area in North Vancouver. 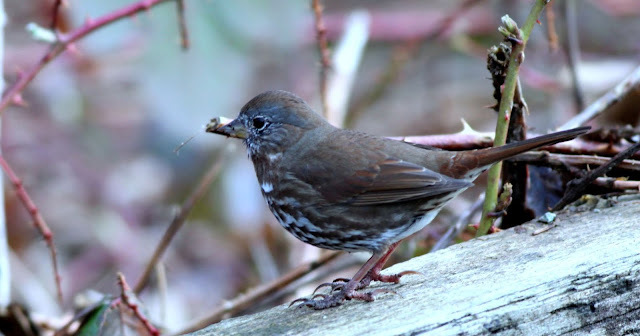 I decided to hit Burnaby Lake on the way, I needed a Fox Sparrow photo and this was a good place to get one. 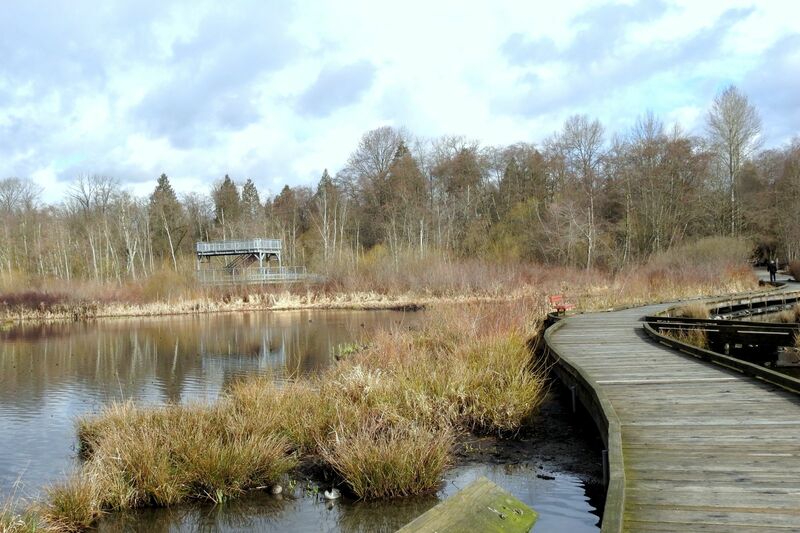 It was quite early and Burnaby Lake was not very busy, it usually becomes very crowded before noon. 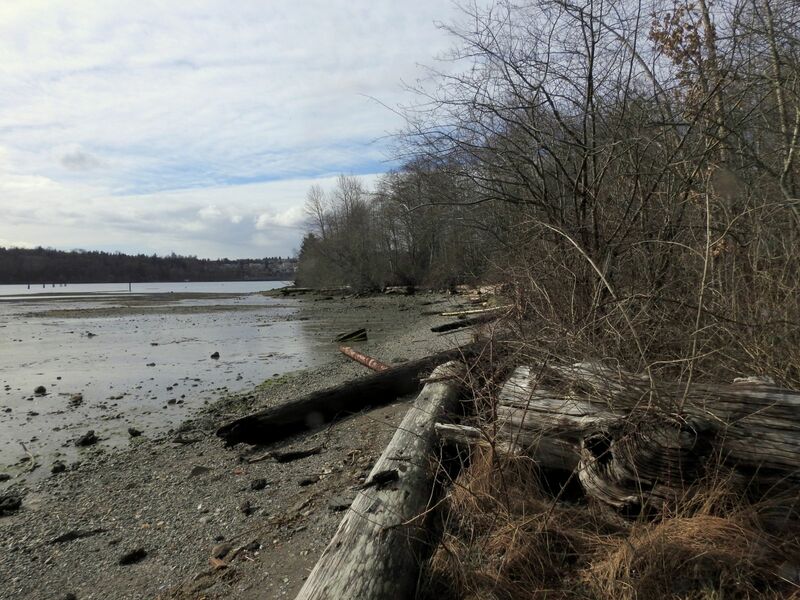 The location I visit is Piper Spit on the North side of the lake, accessible from Winston Ave in Burnaby. 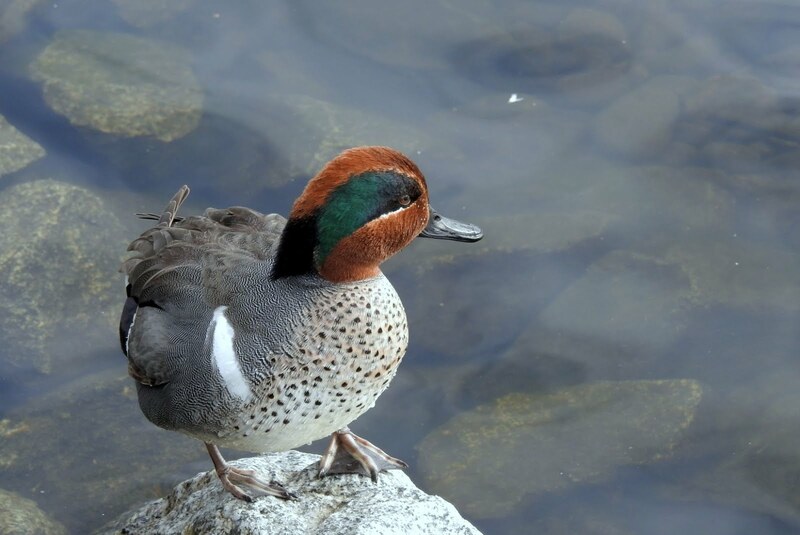 There is a boardwalk at Piper Spit that offers close access to the Ducks that frequent the Lake. 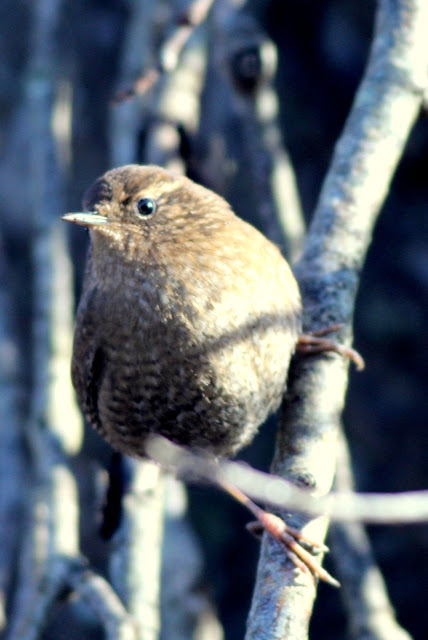 Just after parking my car I heard the familiar song of a Pacific Wren. Try as I might, I could not get a glimpse or photo. It was countable for 2017 as hearing a bird is acceptable under American Birding Association (ABA) guidelines. So this was 2017 Bird #86. The photo below was taken at Deas Island Regional Park on Christmas Day 2016. 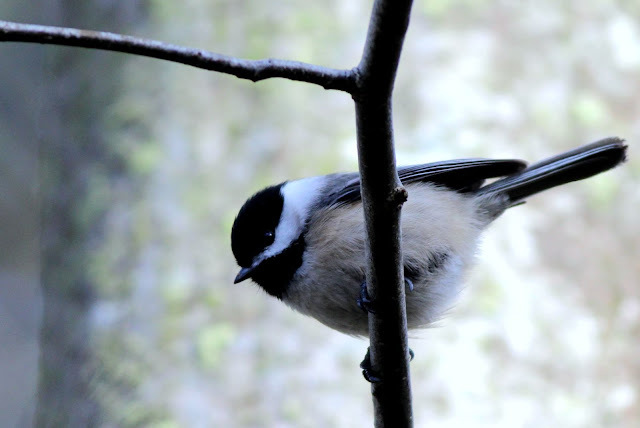 In the same area near the parking lot there were a couple of chickadees flitting around. This photo turned out quite well. I walked out onto the Spit and spotted some Green-winged Teal. This is a great place to see these small ducks up close, they are close to the boardwalk and are accustomed to people. 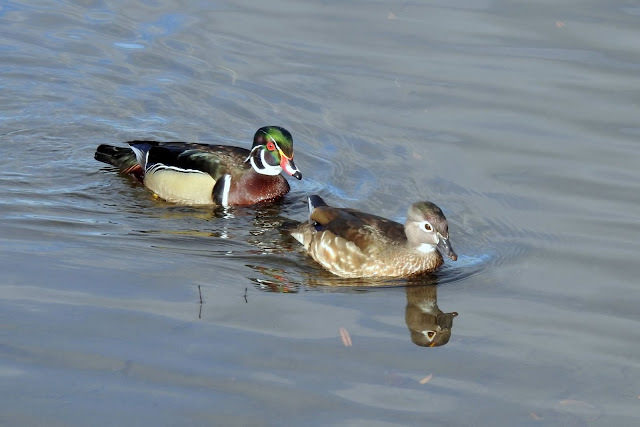 Another common small duck is the Wood Duck. Here's a close-up of a male/female pair. At the end of the pier I have seen Pied-billed Grebes. Green Heron is an occasional sighting. 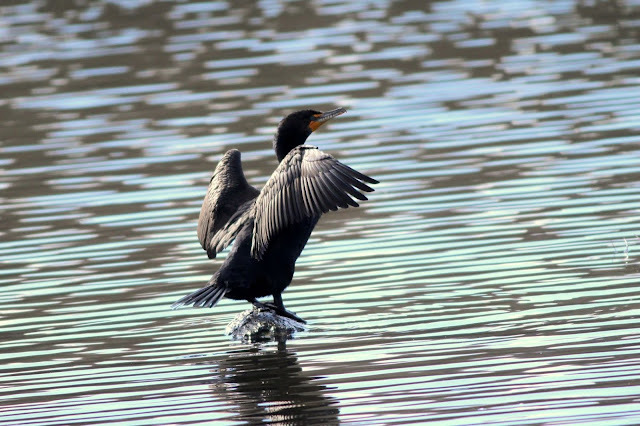 Today there were a couple of Cormorants sunning themselves. The Red-winged Blackbird is a very common bird at Burnaby Lake. I've noticed that people here are feeding them seed out of their hand, just like chickadees. 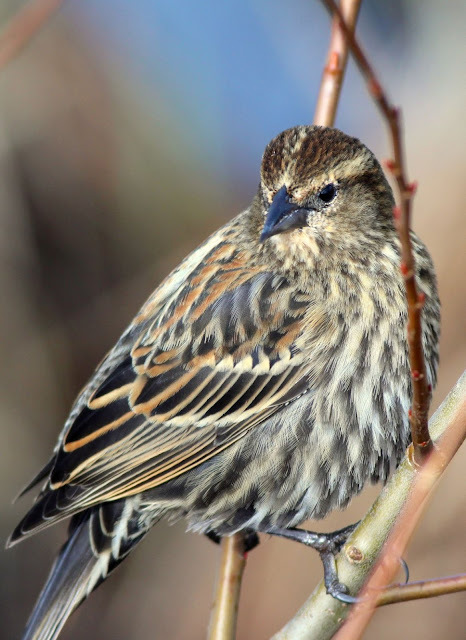 The female can be mistaken for a large sparrow. The Orange on the flanks is a good identifier for the Blackbird. On my way back I checked the sides of the boardwalk carefully and eventually spotted a Fox Sparrow. I'd seen one in January but didn't have time to take a photo then. 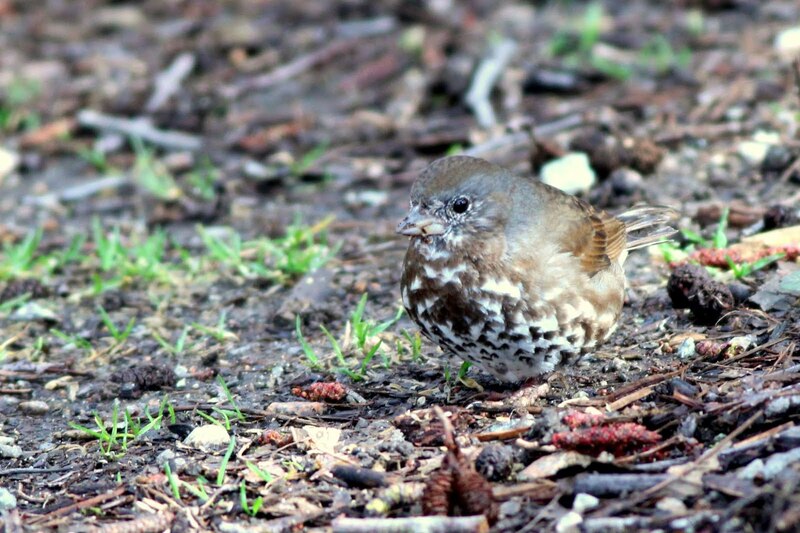 Today, there were a few around and I was able to catch them working in the leaf litter, searching for any morsel of food. 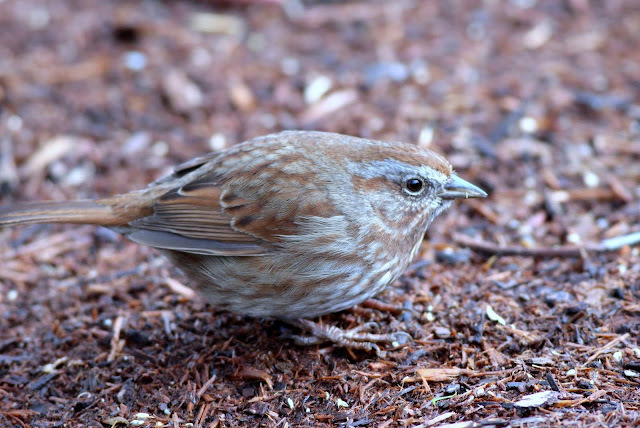 This bird is quite similar to the Song Sparrow, but can be identified by the more rounded head, and the more strongly defined spots on the breast. The plumage is excellent camouflage for the habitat. For comparison, here's a Song Sparrow to show the difference in shape and plumage. My next stop was North Vancouver, heading towards Deep Cove on Dollarton Highway. My luck has been spotty at this location, but I've had a few good days. Part of the problem here is that it is very well treed and the light does not reach many places. As usual it was quiet when I started out. The Say's Phoebe(s) had been seen on the east and west saltmarshes. The east side was very quiet except for a few Spotted Towhees, which were camera shy. This photo is from the east side looking out onto Burrard Inlet. 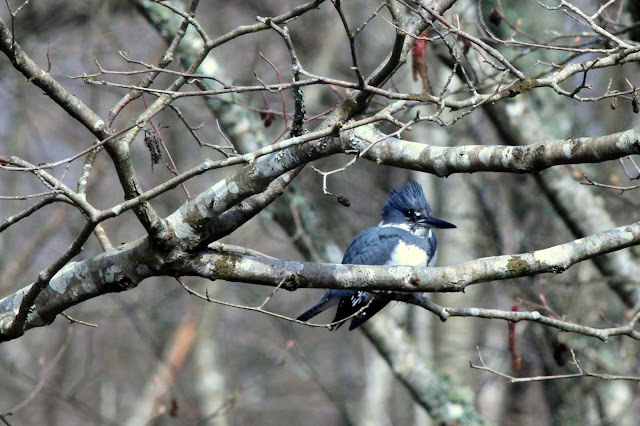 I went to cross the bridge that divides East and West and stopped when I heard the familiar call of a Belted Kingfisher. This one was a male, as it was missing the orange/brown colouring on the breast. I met up with another birder and we circled the east side. 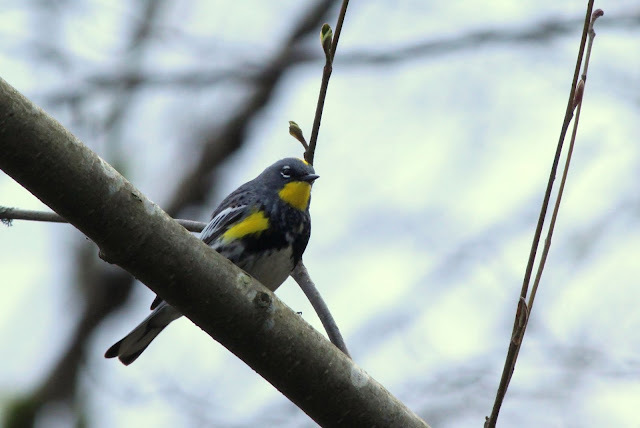 We did not see or hear the Say's Phoebe, but as a consolation prize, we did see a Yellow-rumped Warbler, my first of the year. This was it for Maplewood, another quiet day. I was not finished yet, I also stopped at Colony Farms Regional Park. That is detailed in the next post for March 25.